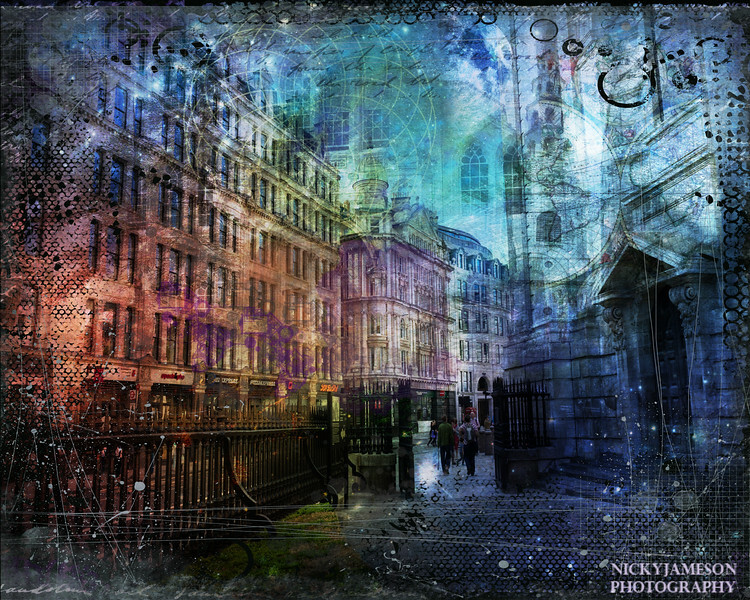 The latest in my Urban Tales series, Jewel Night is made up of four of my photographs, including the church of St Brides, Fleet Street, London (famously known as the Journalist’s church, Fleet Street is known in its own right for where all the press/newspapers used to be) and the area just in front of St Paul’s Cathedral. I thought of including the dome of St Paul’s but then decided to leave that for another composition. My aim was to complement the architecture. I love architectural photography, and with digital artistry I can create fine art stories to include everything I imagine around the architecture as well and offer my own perspective on the architecture. In my imagination architecture comes alive! Instead of a bland grey building, I let my imagination run a little and create a jewel palette that reflects the heavens or a far flung constellation. Who knows what stories the buildings might tell, if only we learned to look up and wonder? Of course,as the viewer you can create any story you want. That’s the beauty of art, letting you travel to places without having to actually leave whereever you are. As I was creating this artwork (and it took me several days as it unfolded) I imaged myself standing in front of a huge Jewel Night, floor to ceiling. Letting the artwork completely surround me so I’m in the scene, looking up at the sky and the moon and the transformed, colourful buildings… as small as the characters taking a night stroll. You can view Jewel Night large, along with my gallery of fine art digital artistry pieces on my portfolio site. In other news, I am very pleased to say that my London artwork is now available to purchase at London Calling Home, which is at 239 Carlton St in Cabbage Town. Check it out for all things “Cool Britannia” including several of my London landmark framed photographs and canvases.